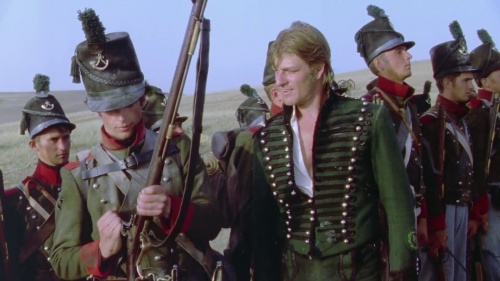 Sharpe's Enemy is the fourth episode of the Carlton UK miniseries Sharpe, starring Sean Bean as Captain Richard Sharpe, the officer of a small Rifles detachment during the Napoleonic Wars. It was filmed on location in the Ukraine and the Crimea. 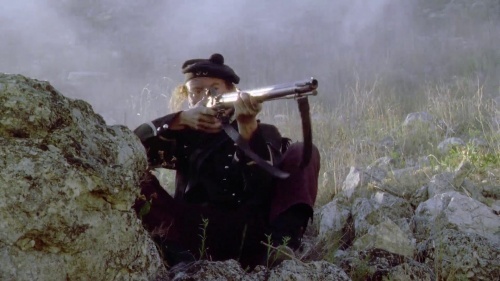 The episode follows Sharpe and his company in their efforts to rescue two women hostages from an "army" of deserters camping along the Portugese border. 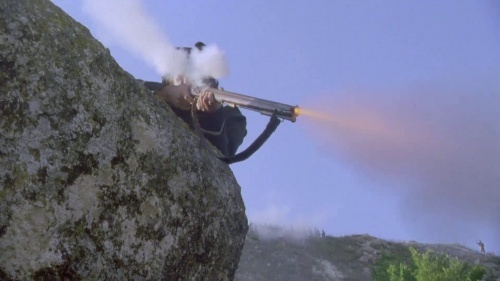 Rifleman Perkins (Lyndon Davies) aims his Baker. 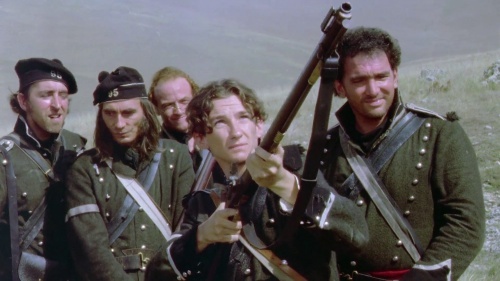 Sharpe and the Riflemen open fire with their Bakers, while Corporal Kelly (Morgan Jones) fires his Brown Bess Flintlock Musket. 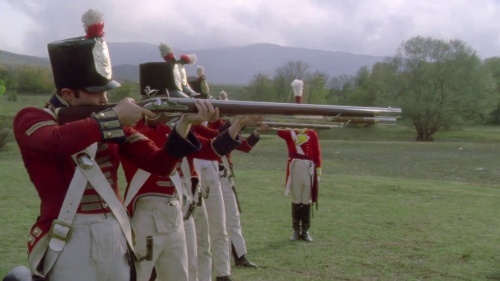 The standard rifle issued to "redcoat" British soldiers is the Brown Bess Flintlock Musket. 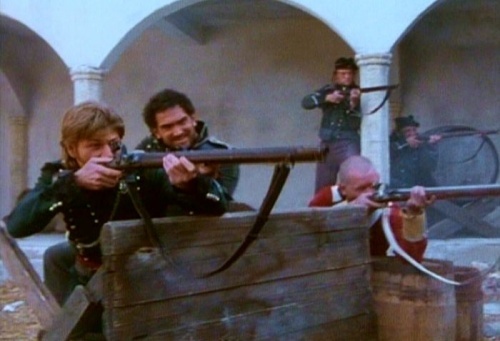 A firing squad takes aim at Hakeswill. 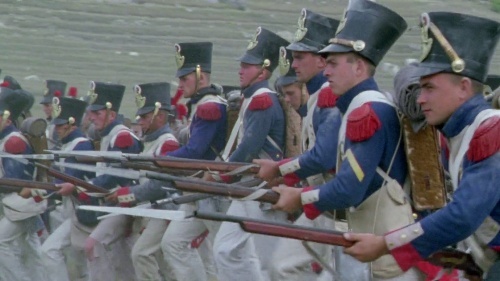 The advancing French soldiers carry Flintlock muskets of an unknown kind. 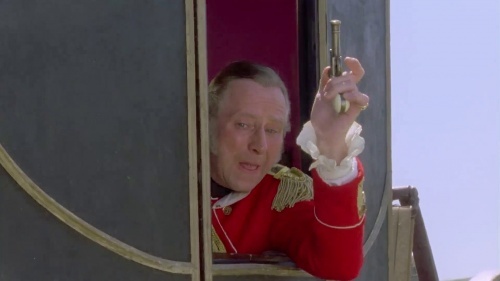 Various characters use Flintlock Pistols of various kinds, including Col. Sir Augustus Farthingdale (Jeremy Child), Hakeswill (Pete Postlethwaite), "Marshall" Pot-Au-Feu (Tony Haygarth), and Teresa Moreno (Assumpta Serna). 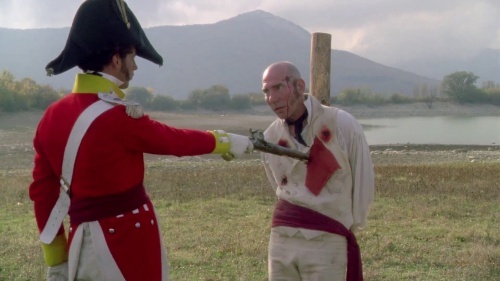 Hakeswill (Pete Postlethwaite) holds his Flintlock Pistol to Isabella's (Elizabeth Hurley) head. 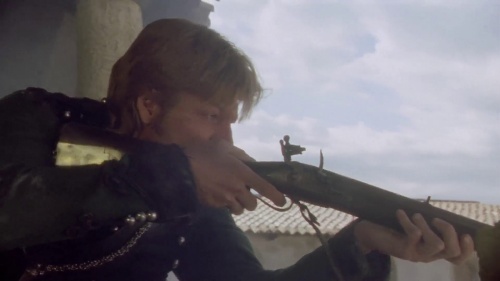 Teresa (Assumpta Serna) is forced to lower her pistol, and is shot by Hakeswill in return. Hakeswill tries to hold Isabella hostage with his (now-empty) pistol. 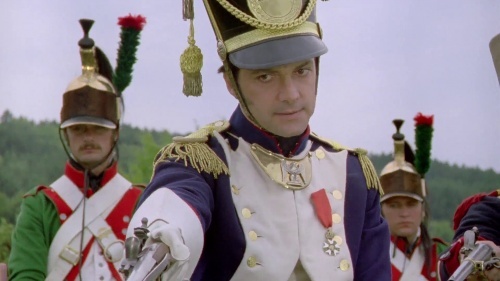 Col. Dubreton (Francois Guetary) holds his own pistol on Hakeswill. 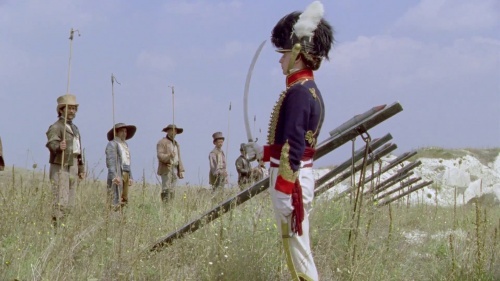 An officer administers the coup de grace to Hakeswill. 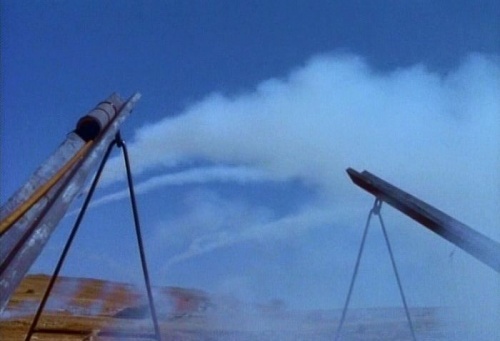 One of the more bizarre weapons featured in the episode is the Rocket artillery invented by Sir William Congreve (1772-1828). 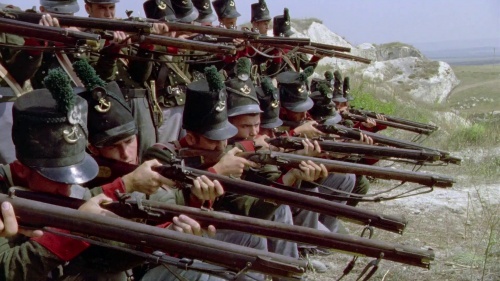 The Prince-Regent of England (the future King George IV) was so awed by these weapons that he insisted on sending a troop of them to the Duke of Wellington's Peninsular Army. But since neither Congreve (nor anyone else) had any concept of aerodynamics, the rockets had no fins, or other stabilizers attached, and thus were wildly inaccurate. 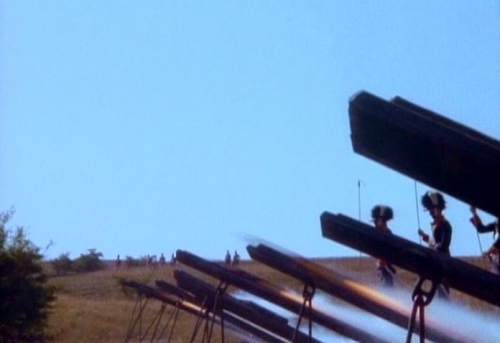 The rockets were sporadically used in British Army engagements in the following years, including during the War of 1812 against the United States, inspiring the phrase "the rockets' red glare" in "The Star-Spangled Banner." 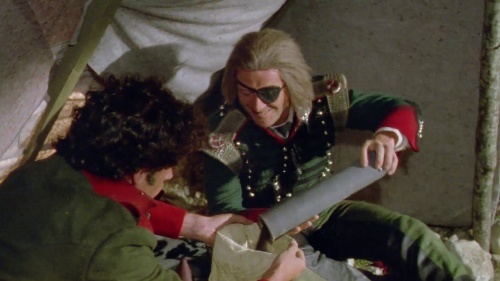 Captain Frederickson (Philip Whitchurch) empties one of the rocket canisters into a sack, making a set of impromptu grenades.